Maybe you can’t cook, or you're a bachelor, or your wife is on a business trip. Here's our survival guide for men about how to quickly cook the simplest and tastiest (though maybe not the healthiest) Russian dishes after a hard day at work. Be prepared - there's going to be a lot of mayonnaise! 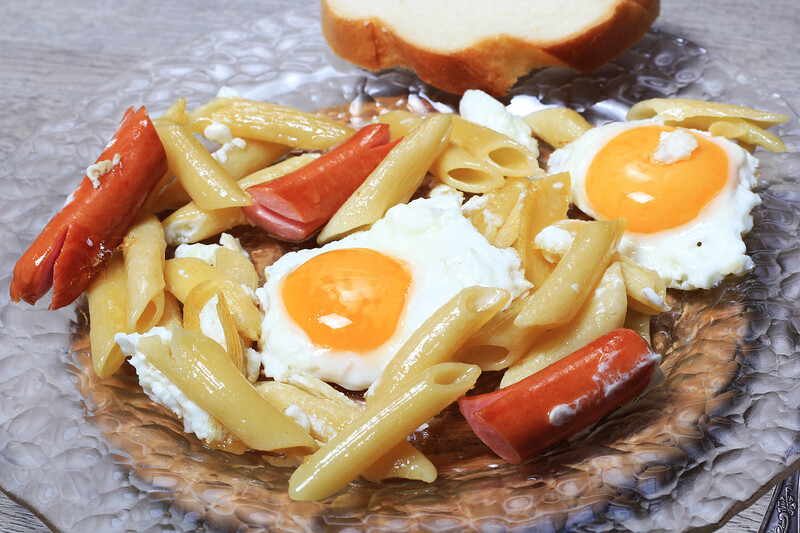 The name of this dish clearly indicates it’s cheap and easy to cook, and doesn’t require to clean plates, as well as no need to use a knife and cutting board. 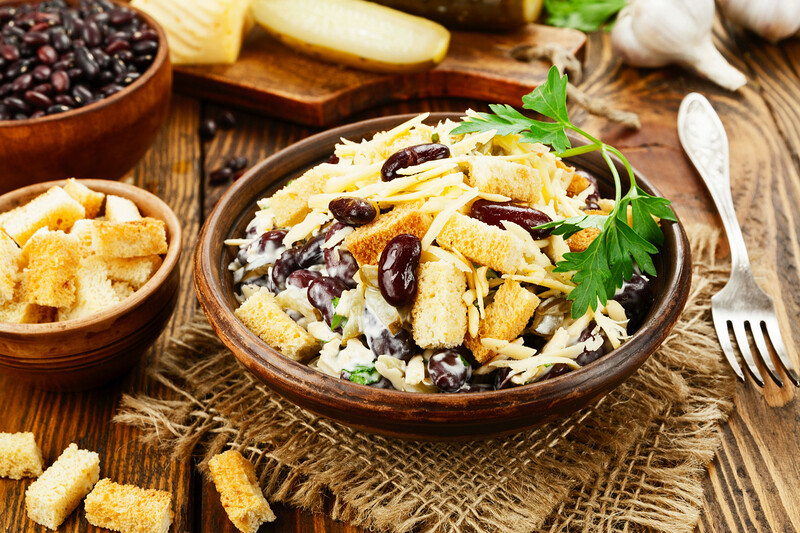 Mix everything and wait a bit until the croutons became softer. Bon Appetite! If you're a more experienced cook, you can add smoked brisket and fresh parsley. This dish has nothing in common with French fries, and tastes even better. 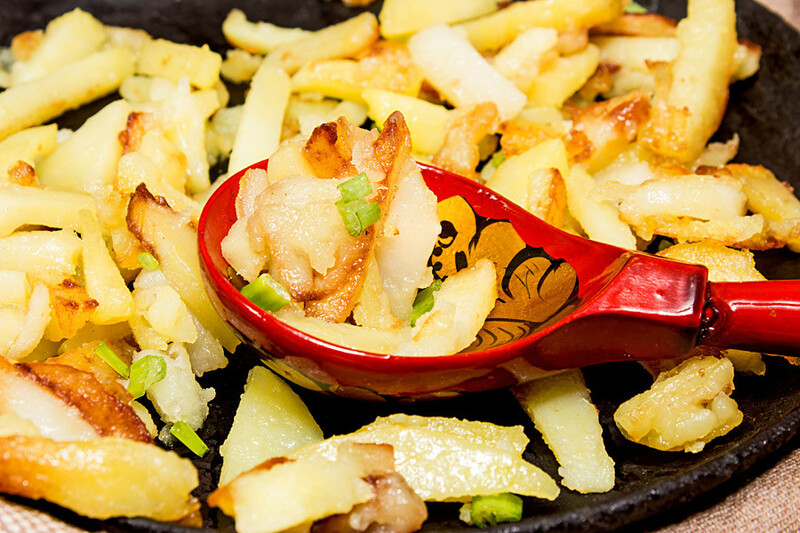 Heat the frying pan, add oil, and when heated add diced potatoes (cut them as you wish). Fry on high heat constantly mixing until the crust browns; then add chopped onion, salt, pepper and spices to taste, and fry until the onion becomes golden. Then put on low heat, cover and fry another 15-20 minutes until the potatoes are ready. Five minutes before they're ready add butter and cover again with a lid. Russians usually add chopped dill or parsley, but it’s up to you. The dish is a perfect snack with beer. This dish comes from Soviet canteens when there were only sausages seemingly made of paper. Needless to say, it was also a cheap dinner option for students. 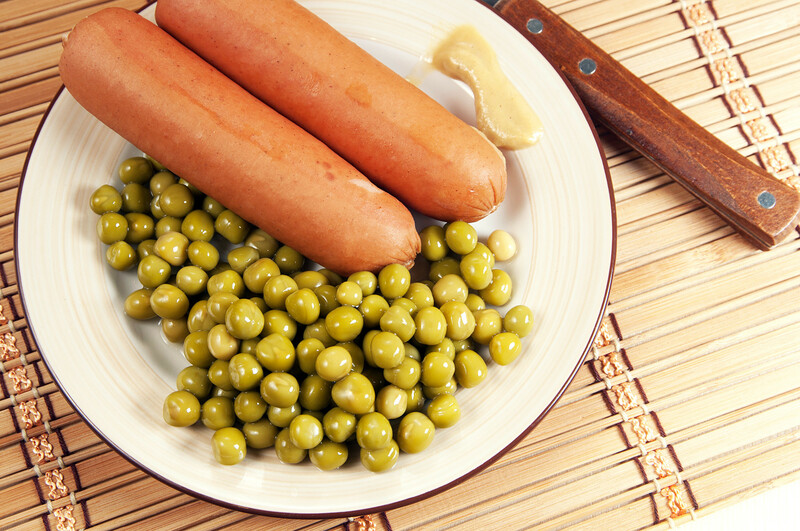 You'll be surprised how easy it's to cook: boil sausages, or fry sausages, or microwave them. Put on a plate and add peas from a can. Voila! Wedon’t call it meat pasta because Italians would kill us for offending their traditional recipe. Try to cook the macaroni as written on the packaging: boil water, salt and prepare the macaroni for about 10 minutes. Remove the water and add a little butter. Then open a can with your favorite meat and add. Mix well and enjoy! For those who have the time and culinary skill, you can fry chop meat with diced onion and then add to the macaroni. This dish is called macaroni po-flotsky (navy-style macaroni). Actually, no one in Russia calls it a sandwich. Instead, we call it buterbrot (from the German word). Everything is very easy and tasty! 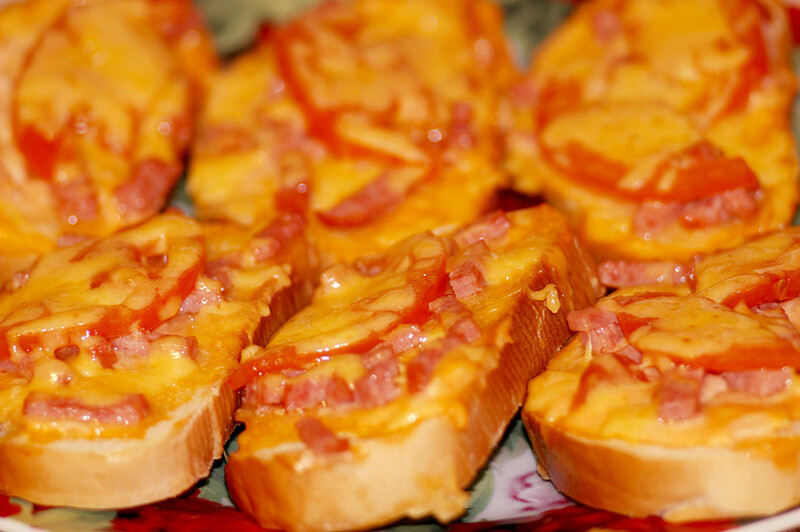 Take a slice of bread, cover it with ketchup, add whatever meat you have and cover with grated or sliced cheese. If you have lettuce or vegetables, also add them, and after two minutes of microwaving – enjoy! But be careful, it’s hot! Another great idea when traveling or going to work – make a cold buterbrot, wrap in foil and take with you. There are two options for preparation. The first one is easier, quicker and doesn’t require washing lots of dishes afterwards. You just have to heat a pan, and fry the frozen pelmeni with butter or oil. Stir so they don’t burn. In the end they should be very brown and crispy – just fry them until the meat inside is ready. The second option takes more effort. Put frozen pelmeni in boiling water for about 5-7 minutes. 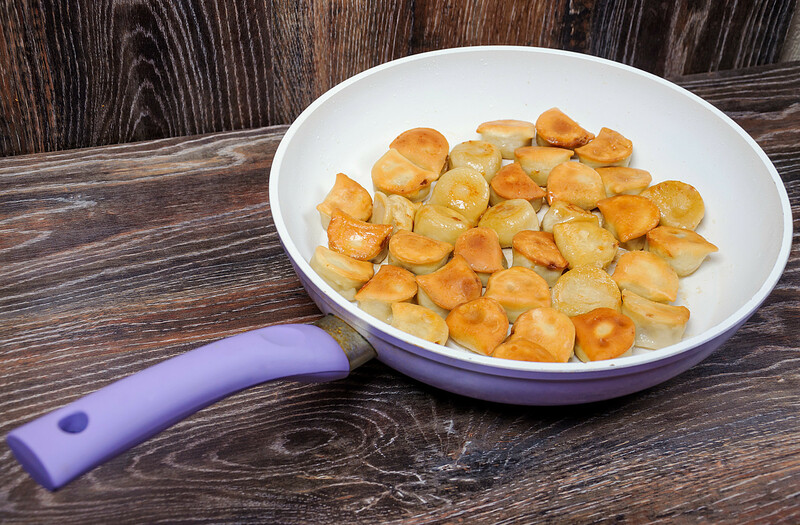 Then remove the water and put the pelmeni on a heated pan with oil or butter, and fry until crispy. This way, the pelmeni will be softer and tastier. If you're a true connoisseur, then bake the pelmeni after boiling; just cover them with cheese and put in the oven for 10 minutes at 200 degrees Celsius. The most popular topping for this dish is mayonnaise, of course! 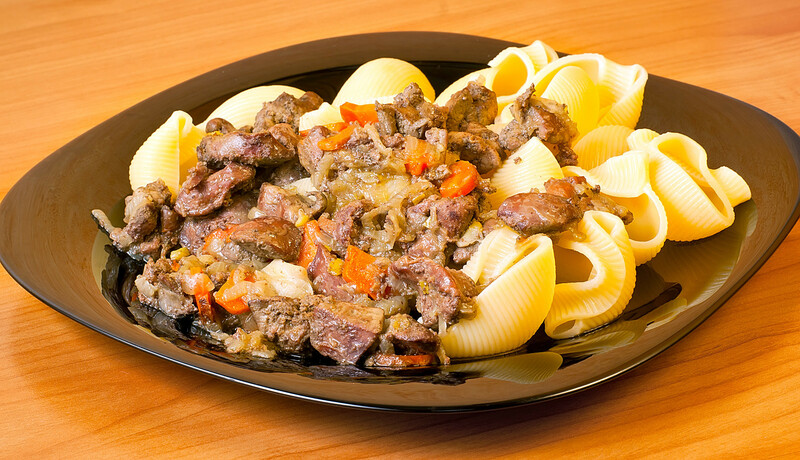 This is probably one of the most exotic recipes that all Russian men have cooked at least once. First, look inside the fridge. What can you find there? Leftover macaroni with canned meat, fried pelmeni, or fried potatoes – everything works! Heat the pan and put everything you have in it, warm a little and mix. Then add eggs and fry until the yolks are ready. You can mix while frying or just let it be. Use your imagination. It’s both nutritional and tasty! 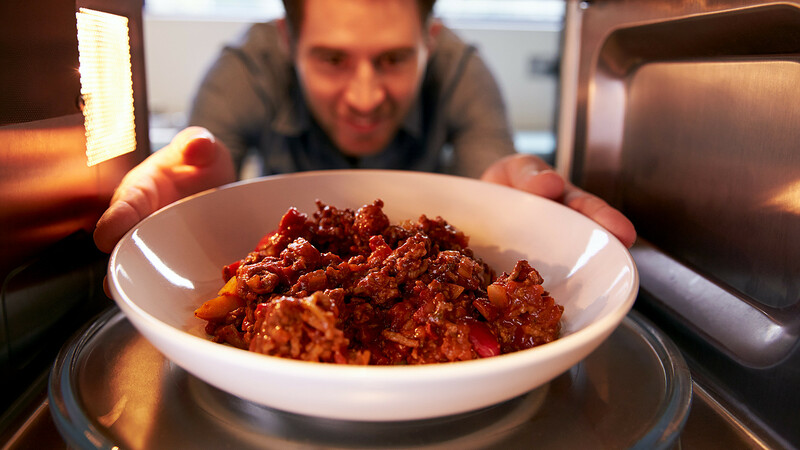 What 'exotic' dishes have you cooked recently? Please share in the comment section below.